Cold weather didn't stop about forty people from stopping by the Nazareth News Agency last night. Blogger Ross Nunamaker from NewsOverCoffee delivered on his promise. He facilitated an excellent "nuts and bolts" presentation for residents interested in becoming a candidate for municipal office, from nominating petitions to campaign finance reports. Borough council members Jack Herbst and Cindy Werner were on hand with tips on running for public office. And local party chairs Joe Long and Roy Shuman explained how they can help. Herbst and Werner's interest in borough council grew from participation in Nazareth's many grassroots movements. Jack's advice? "Don't forget. It's shake hands, kiss babies. Not kiss hands, shake babies." Cindy Werner biggest surprise? "They handed me a check. I didn't know we got paid." Long and Shuman talked about going door to door, fundraisers and picnics. Shuman, a pretty thin guy, warned, "You're going to eat a lot." Before tonight's discussion, Express Times Editor Joe Owens worried how many "average Joes" would bother to show up. He'll be happy, I'm sure, to learn that Lehigh Valley residents are finally waking up and getting involved. It's a nice thing to see. The only disappointment last night was the absence of Northampton County's elections office. When Ross visited that office to pick up materials, office workers hesitated until Registrar Deb DePaul was available. And she declined Ross' invitation to come or send a representative. "I have a busy schedule." Northampton County Executive John Stoffa is so frustrated by our unresponsive elections office that he named a five citizen advisory committee to answer "how we can do better." Last night was a missed opportunity for DePaul to help forty people understand she's there to help them. Congratulations to Ross on a job well done and well received. Update: Both the Express Times and NewsOverCoffee have their own well-written reports about last night's "resident to candidate" event. Christ Bernie, what the hell's that a picture of? 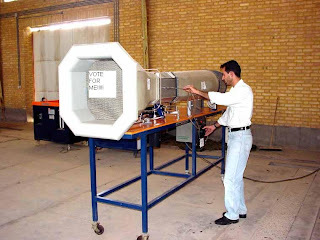 It looks more like a military subatomic particle accelerater than a voting machine! Is the county planning to vaporize people they suspect of voter fraud? Well, that's my suggestion for the dude who wants to save a few bucks in mailers. It's a giant megaphone, guaranteed to spread your message in a ten mile radius. And where was our Northampton County Registrar, the pulchritudinous Ms. Deborah DePaul, last night. As for me, I was exhausted from a busy day that began, providentially, in her office. She wasn't present there either, to Passist me in changing my voter registration from Republican to Un-affiliated. I say "providential" because a woman from Bethlehem standing at the counter next to me was there filling out forms for her husband whose girding himself to challenge Robert Donchez, Gordon Mower, and Magdalena "Maggie Drawers" Szabo. Maggie Drawers also packs twin lethal hearing aids. They malfunction when it serves her; e.g., when she testified before Northampton County Council on Councilwoman Mary T. Ensslin's proposal to "grow" Bethlehem's health department into a burgeoning county-wide bureaucracy. On this controversial subject, Maggie, also a.k.a. "Magpie" szabor, first cousin to the 19th-century poltical bird, the Mugwump (and in this century John Stoffa), elected not to fly and get shot down by Billy Bytes, but to remain safely on the fence. But at the "public hearings" on casino-racino gambling, she sang the praises of Sheldon Adelson, William Weidner, Barry Gosin, Jeff Gural, Joe Santana,and Mike Perrucci like a songbird. Indeed, Maggie performed this way throughout the gambling hearings, and, unlike the "Maggie Drawers" Szaboe, hit the bull's eye of Governor Ed "Willie Stark" Rendell's, John Perzel, Vinnie Fumo's, and the PGCB's Act 71. My day ended in the foyer of The Express-Times, where reporter Sarah Cassi (spelled with an "h," like my older daughter, Sarah Parker-Givens)interviewed me on my revised candidacy and campaign plans. It's awesome that a group of Nazareth residents are so involved. Good for them! Can we get Billy his own planet? Nobody reads his blog, so he goes aroung clogging the comments of others? good outcomes... too bad the registrar didn't show. Give Joe Long some credit for doing this. This is what a county chair should be doing. Billy Givens...brevity, old man, brevity! While you may well be the eloquent linguist Bernie claims you to be, when we see your longwinded comments, we pass right over 'em, old beauty. Shorten it up a bit & your time awritin' wont be awasted. LVDem, I agree with that assessment. It was refreshing. And both party chairs did offer help in the form of walking maps, lists and things of that sort. My childhood pal, Danny R came and brought a body guard and they flanked me on the left and right. They were worried Long might try to kiss me again. Bernie, for the last time, Joe wrapping his hands around your neck and shaking you violently is not kissing. That's called strangulation and it's not something you do with your lover. Man, we need to get you a doll or something. Wow, that was mean. That makes up for my nice comments about you yesterday re: controllers race. Hats off to Ross and the party chairs! And a credit to the candidates and potential candidates that came out last night - EXTRA points to those who showed up to support local politics! Thumbs down to those candidates who didn't see the value in supporting Ross and the others who braved the cold to energize another election season. What's the date for the candidate meet and greet? LVDem, I already have a doll. I got it cheap at a yard sale in U Macungie. Anon 8:40, I'll ask Ross if we can't set something up like that for the local candidates. I think it's a great idea. Kissing, strangulation, and party dolls aside, many thanks for the post and comments regarding the event. I have worked on campaigns and was involved in one that had a petition challenge, but I've not been a candidate, filled out the paperwork, or helped someone do so until last night. I was hoping that someone from the office would give a walk-through of these materials, but it didn't work out. I handled it as best I could having given myself a crash course and reading alot. I was worried about the turnout and thought 20 would be great, Joe Owens told me 20 would be a smashing success. When the people piled in and we were short chairs it was a good problem that was resolved within 15 minutes. We ended in an hour and from the feedback I received it was worthwhile. I hope others replicate the event in other communities in the future. I have all the notes posted on my site and hope to get audio up this weekend of the candidates and party leaders Q & A. Thanks again (and yes this was a bit long-winded - sorry). Ross, You did a great service for the community and because you care. It's unfortunate that a paid public servant did not share your attitude. I thank you for supplying copies of the email exchange you had. This comment is by my way as a candidate for usurper Tony Branco' seat on Northampton County Council previously occupied by Council District 3 Mike Corriere. This seating arangement was designed further to confuse the public. It goes far in explaining my alarm when I read The Excess-Times reporter Sarah Cassi's last Friday's article misleading voters re at-large and district council candidates. The confusion of the seating arrangement is that District 3 representative Lamont McClure should occupty Branco's seat and at-large representaive Branco McClures - the seat formerly warmed by at-large representative Mary T. Ensslin. While on the subject of candidates, I am hereby launching a campaign nominating Ron Shegda, a Hellertown resident and casino-racino gambling foe, to challenge the Bethlehem City Council seat of District 1 representive Ann McHale in his ascension in 2008 to the seat of 136th Legislative District pro-gambling incumbent Robert Freeman. I will have more to say about today's candidacy for Easton City Council of Nadine Loane. In 2001,Nadine and other opponents of the Chrin Brothers Landfill expansion in Williams Township accompanied me the Northampton County Council meeting held in Courtroom #1 where our love-hate relationship over the years was born. It's a relationship that reminds me of my late roughneck merchant seaman father William "Red" Givens who used to say, "I wasn't born, two railroad boxcars collided and I emerged from the impact's middle." Between my visit to the Northampton County Registrar's office and my interview with The Excess-Times county-beat reporter Sarah Cassi, I kept an appointment in Belvidere with one of the doctors who are treating me for cancer. White there, I stopped by The Excess-Times Warren County bureau offices to check in with county-beat reporter Tom Quigley on the status of the Alice Mae Kitchen's custody-hearing trial initiated by her grand-daughter Diana Kays Kitchen. Tom informed me that his editor had killed the story. I then asked Tom about the Warren County Pollution Control financing Authority investigation that the PCFA has referred to the New Jersey Attorney General's office and to the FBI. Tom told me that was the bailywick of a reporter and that he would have her call me. Back in Easton, in my interview with Sarah Cassi said it would be published in the next day's edition, Feb. 8. The Excess-Times did not publish the interview, however, and has still not published it to this date. So I'm afraid, Bernie, that you may be mistaken when you write that the "Lehigh Valley" mainstream media don't manage the news. If, however, the interview was published, and I missed it, please tell me and I will be the first to apologize. Hopefully if the Northampton County Registrar was too busy to come help out potential candidates in Nazareth, she was looking into why Tommy Itterly of the Nazareth Authority is living in Allentown but recently switched his voter registration back to a Nazareth address (to make it appear that he lives in Nazareth and is not on the Authority unlawfully). Anon 8:07, I read Bill White's column. I also rec'd an anonymous packet a few months ago detailing everything that was in Bill White's column. I called and spoke to Itterly. He told me he considers Nazareth his home. He also tild me he pays taxes in Naz. If he is a Naz taxpayer, then whether he resides here or not is immaterial. I called around and told some people who were behind this that I would talk about it on the radio and they got scared. So I dropped it. I'm glads Bill White wrote about it bc it shows Al Pierce is really still in the shadows. He should have explained the situation. Bernie, it is a shame that Itterly can just lie and get away with it. According to the Northampton County website, he does not pay real estate taxes to Nazareth. Has anyone checked on where his EIT gets paid? Maybe he has switched where the EIT gets paid, as he switched his voter registration back to Northampton County. The explanation Pierce gave the newspaper is very weak. So weak, that it is obvious what is going on. It is immaterial where Itterly considers his home. He moved out, plain and simple. How many people do you know that buys a house, moves your belongings out of a house and into the new house in a different County, transfers the ownership of the house you moved out of, changes voter registration to a different county, pays EIT to the Townhip where you moved, but can still claim they live in the town they moved out of? Only in Nazareth. This is one of the many ways Northampton County manipulates and controls the vote and thus the desired outcome of elections. Another way is "fixed" electronic touch-screen voting machines that leave only smudged fingerprints and no paper trail to verify for which candidates the fingers voted. Bethlehem's Newest Magistrate: Buddy Christ! Nazareth Beware: The Eye of Mordor is Watching! Are You a Commie Pinko or a Goosestepper?